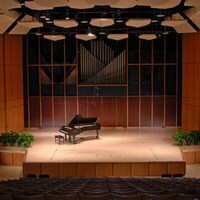 The Georgia State University School of Music's Kopleff Recital Hall is located at the corner of Peachtree Center Avenue and Gilmer Street inside the Arts and Humanities building on the Georgia State campus in downtown Atlanta. Parking: Parking is available in the Georgia State "I" lot located under the Arts and Sciences Annex building on Peachtree Center Avenue. The door to the building is on Gilmer Street, and the Recital Hall is located on the first floor. Alternate parking is avalable to the public in deck "G" for a small fee, and street parking may also be available. MARTA: Take the North/South or the East/West line to the Five Points station. Exit toward Peachtree Street. After exiting the station, turn right on Decatur Street. Go through the first traffic light at Park Place, and turn left at the next light on Peachtree Center Avenue. Stay on Peachtree Center Avenue to Gilmer Street (second light) and turn right. The entrance to Kopleff Recital Hall is immediately on your right.